A few months ago I became a two planner girl. Then a little while after that, I became a three planner girl. (I've since dropped back down to two planners....but three is always there for me if I need it!) Is this necessary? Probably not, but if you're a planner junkie like me you kinda can grasp the idea. I think I got really into planning a little over a year ago . Baby planning Moe was dead against pretty planning. 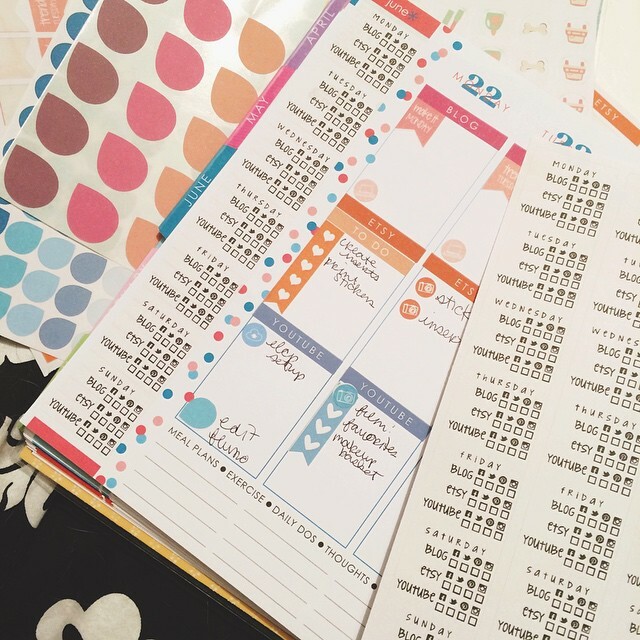 In this video I outright say that I don't understand those that fill their planners with stickers and washi tape and paper clips and journaling cards, etc. I'm here today to say I've changed my ways. I've come to the dark side....and I kinda like it. my first planner was this half size binder from Target. My next planner was a Filofax Saffiano - very affordable. It was the A5 size so a little bit bigger than half letter size. It became too big for me. 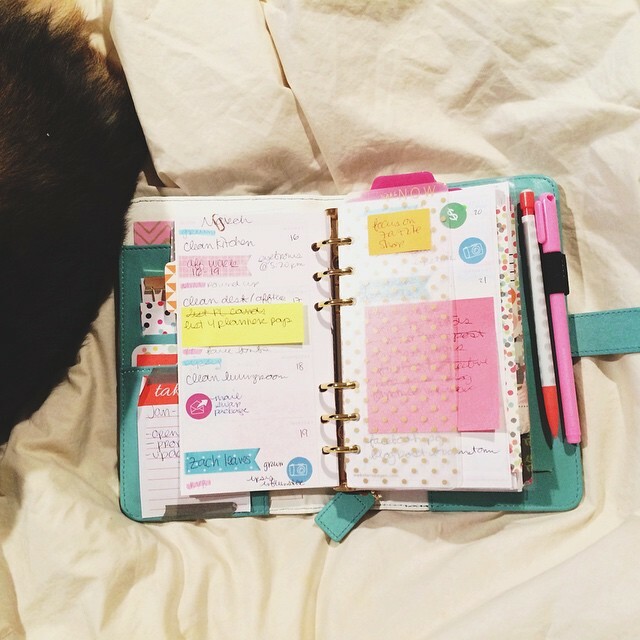 Honestly, I don't know when it started - probably with my Teal Color Crush planner. It was from a scrapbooking company and I've seen so many scrapbookers come over to planning and I think the decor thing for me was born out of my love of Project Life (which I've mentioned before is horrrrrriiiiibbbbllllyyy neglected. Though I do have plans in the works. Promise). I used my Teal Color Crush for everything. Because it was so thick - even for a personal sized planner - I had my blog, etsy, youtube, and personal planning in there. I moved down from my Saffiano A5 to the Color Crush and I still felt like I could fit everything. Then my baby showed up on Zulilly over Easter this year. Yes, I remember ordering it on my phone from the car I was in with my Aunts and Grandma in Michigan. Yes, I realize this makes me crazy...but I did it, ok? This is my teal Color Crush planner - it is super thick. See a comparison video here. So as soon as she arrives in the mail, I melt. I try to stuff everything up in there...and I can't. 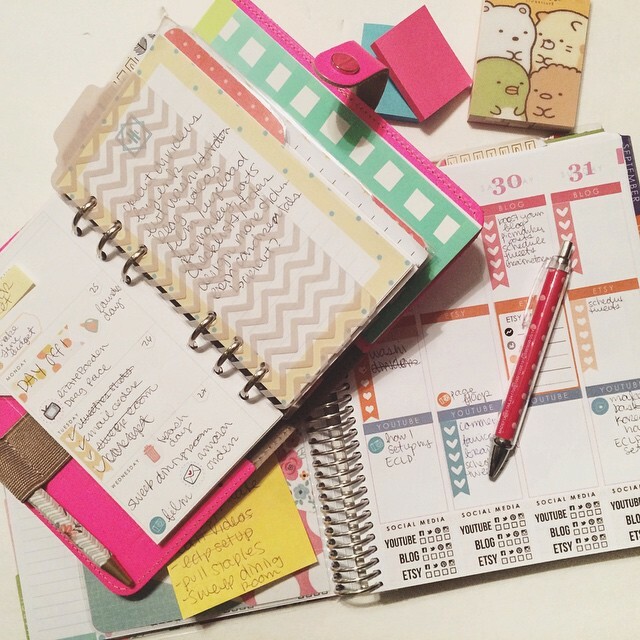 I have a planner melt down (not really) and wonder how I'm going to have all the things. Then hits the Erin Condren sale in early Summer 2015-ish. I get an ECLP for $25.00 (ps. 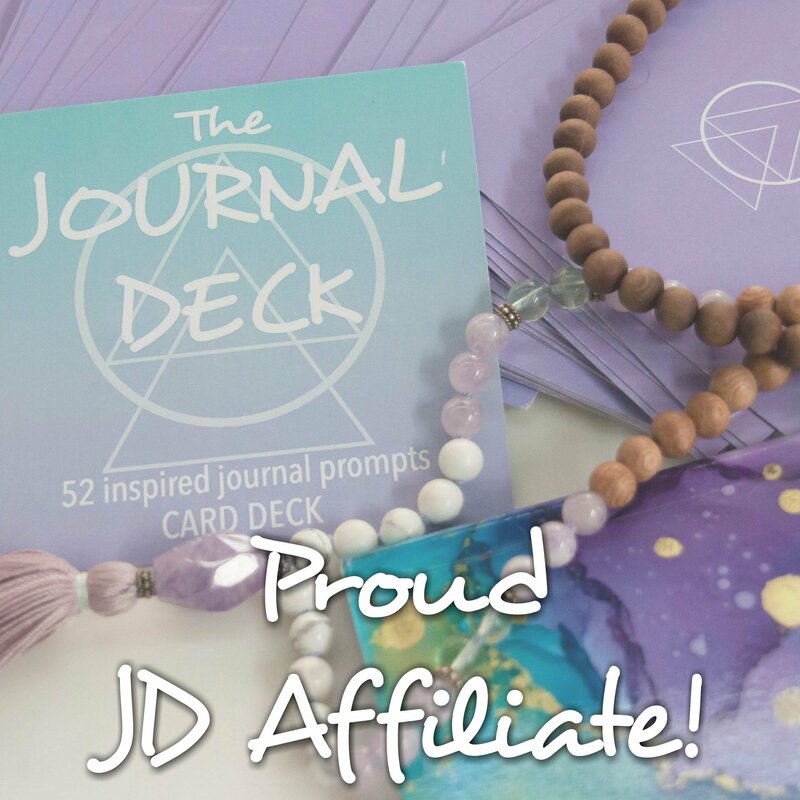 save $10 on your first order with a new email address by clicking here) and move into it as my blog/etsy/youtube planner. I love it because it has three sections per day - perfect to divide my three areas of business into. My Flouro Filofax in the personal size along with my Happy Planner - you can see how much the Filofax is stuffed here! I started to use the month pages in the ECLP as an editorial calendar and then the weekly pages to plan what I would do under each section of the week. 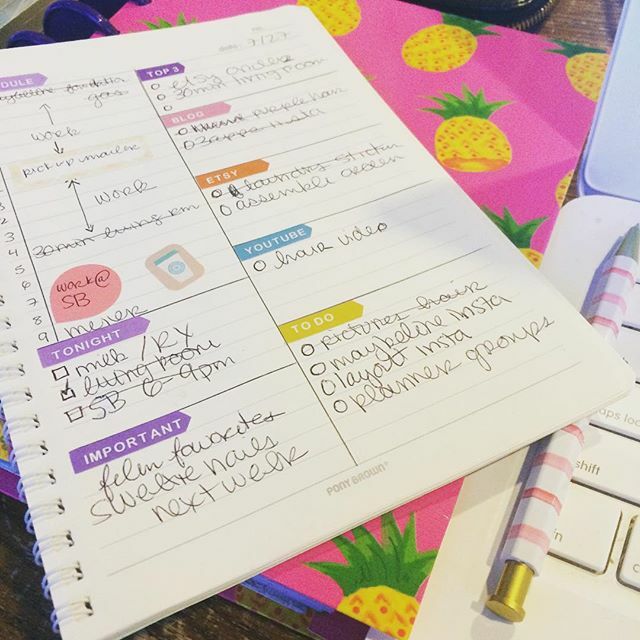 This helped because I had a lot of space for exactly what needed to be done and I didn't have to put it in the small areas in my personal planner (the Flouro Pink Filofax Original - set up here). I also used the notes pages in the back for future planning, youtube schedule, and blog ideas. I continued to use my Filofax for personal planning. If I needed to mark out time for filming or something I made sure to put that in my personal planner so I wouldn't think I could do something else then. That was really the only cross over. You can see a plan with me in my ECLP here. As for carrying my planners, originally I had both the ECLP and the Filofax in my bag. It has only been recently that I've realized carrying both of those planners wasn't helpful. I hardly ever looked at my ECLP when I was out...so why did I need it? Planner separation anxiety I guess. Shortly after moving into the ECLP I realized I didn't have enough room to jot down ideas. I was having to use sticky notes on one blog page in the back of the planner for fear I'd run out of note space. 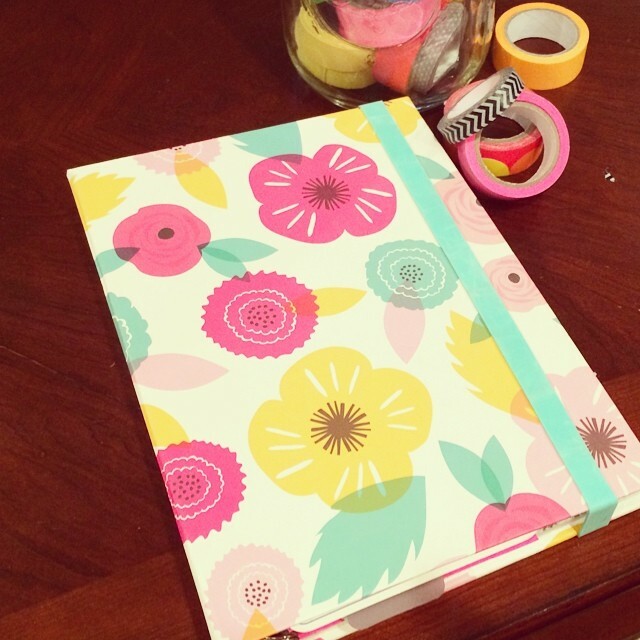 Soon after this the MAMBI Happy Planner was released. This Happy Planner was my favorite for sure. I didn't carry it with me as the discbound system seems not well suited to carrying in a purse. I kept it out in my creative area and used it to plan in my new day on one page planner as well. It gets planned in/decorated every week to plan out what I will do for the blog/etsy/youtube. The monthly calendar is still used as an editorial calendar. The weekly layout is the vertical style with three headers. The boxes are slightly taller than the ECLP which I like, but the width of the boxes is the same. So any ECLP stickers I have fit perfectly. 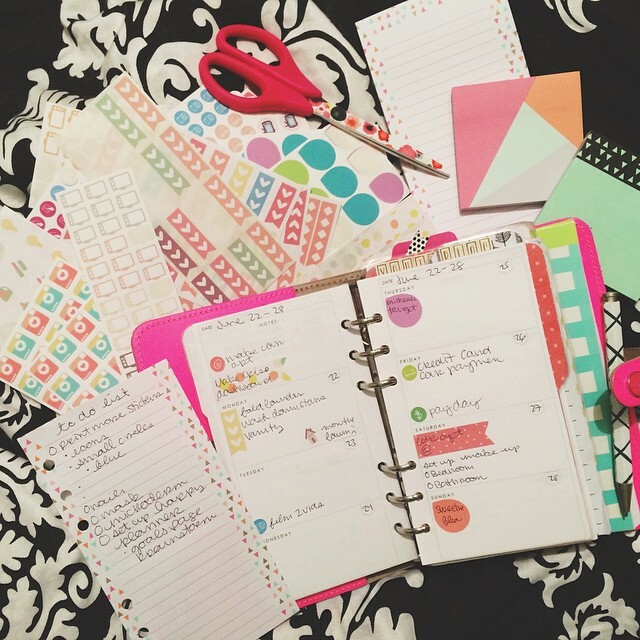 The notes pages in the back mean everything is in one place - I don't have to reach for multiple planners if I'm just working on the blog, etc. 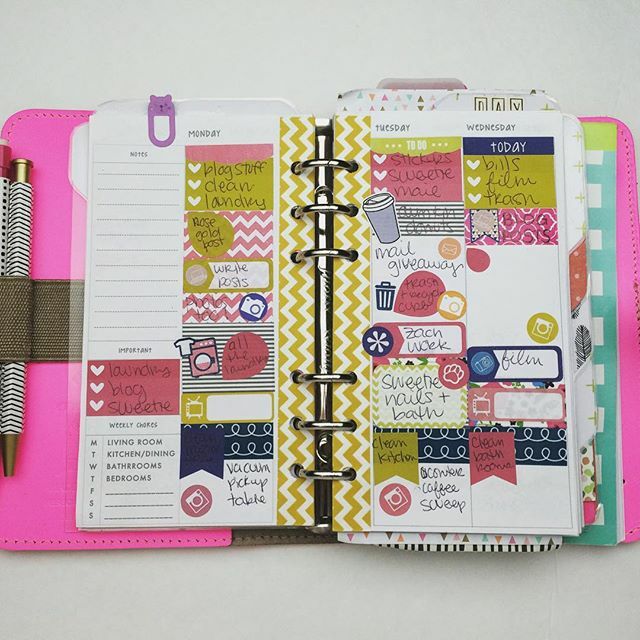 I used to use weekly inserts like the inserts above but now I use vertical inserts like the ECLP or MAMBI planner. 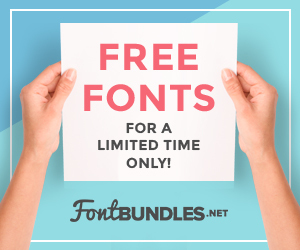 You can find free half letter sized inserts (fits A5) here. My filofax is still for weekly planning. So on Sunday I'd plan out the week in my Happy Planner and my personal Filofax. Usually I'd plan one (the Happy Planner) and then the other (the Filofax) but sometimes things would overlap personal to business or business to personal so I try to be flexible. 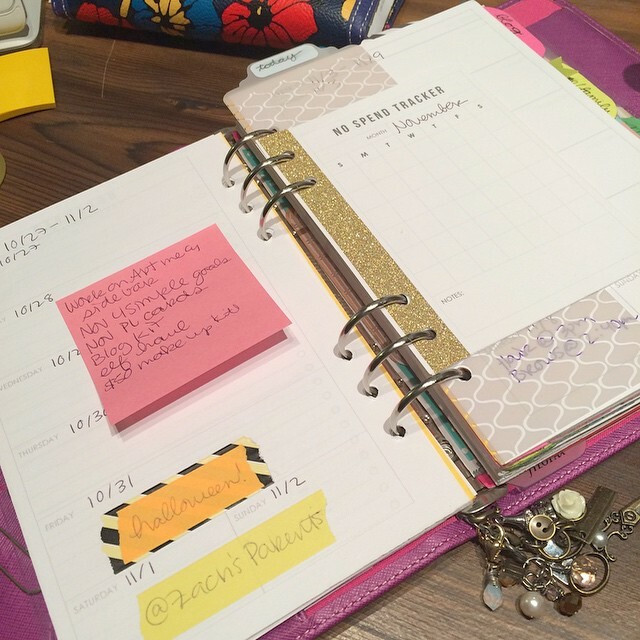 Because I plan weekly I noticed I was getting super overwhelmed and not completing any tasks. So many weeks in my Happy Planner had zero tasks marked off because I tried to do so much I just didn't know where to start. Then the Target Day Designer came out in the middle of my No Buy July and I was so jealous. #PlannerEnvy if you will. So I sat down with an old notebook I had and made my own day on a page planner. At first I thought, why the hell do I need another planner...especially since 98% of my day is me working at a job that I really don't need a planner for. I thought about it for a while and decided to just make one with the divisions I'd like to have in a daily planner. 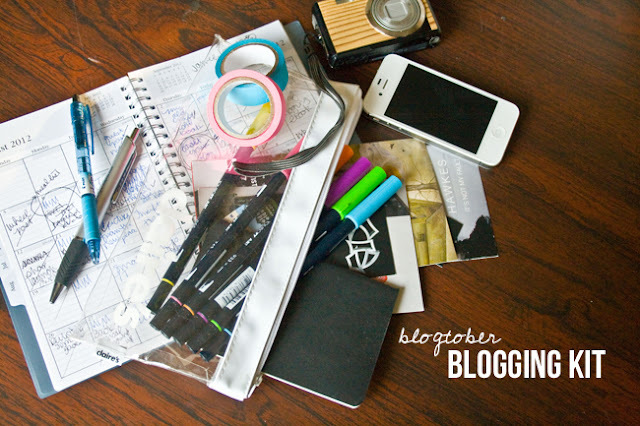 The most important was to have sections for the tasks for blog/etsy/youtube & a to do list. Loosely based off the day designer design I came up with a day on a page with those sections as well as an hourly schedule, a tonight section, a top 3 section, and an important section. This has helped me tremendously because I now only see what needs to be done today. The important section is only for things I need to remember in the coming days or weeks - birthdays coming up, things to be done the next week, or things I need to research/plan. I don't feel overwhelmed with this set up now. After I used this set up for a bit I decided to break out every gadget I have in my crafting arsenal and create my own planner to fit my needs. 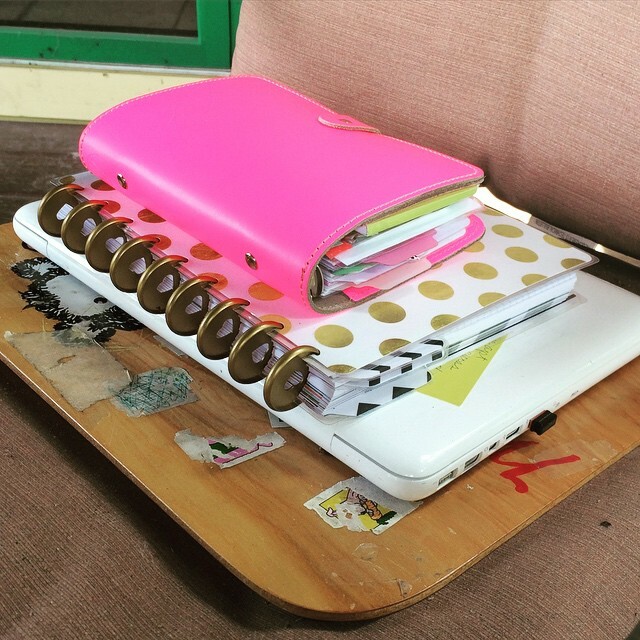 My crazy three planner set up! I continued to use my DIY day on one page planner that I made with my Cinch - super cool tool by the way - for a little while. But then the A5 flouro in the A5 size showed up on Amazon.......and I scooped it up. I moved out of my Happy Planner and into the A5 flouro. I couldn't stand the way the ECLP inserts stuck out of my Filofax so I designed my own half letter sized inserts in a vertical format and loved it. I now use this for my blog/etsy/youtube planning. With the rings I can move things in and out and the whole set up is a bit more sturdy than the arc system that was the Happy Planner. I liked my vertical set up in my A5 so much that I made a smaller, personal sized, version to fit my personal planner. I also made day on one page inserts to fit my personal planner since I knew that the weekly views were so overwhelming to me. The vertical version in my personal sized planner divided the week in to 3 days on one spread and 4 on the other - it was a week over four pages. And then I didn't need my day on a page any more!! I love the vertical layout so much. I'm not overwhelmed when the week is broken into sections. Hooray! My current set up is a 2 planner system...and I don't know if I'll go back!! 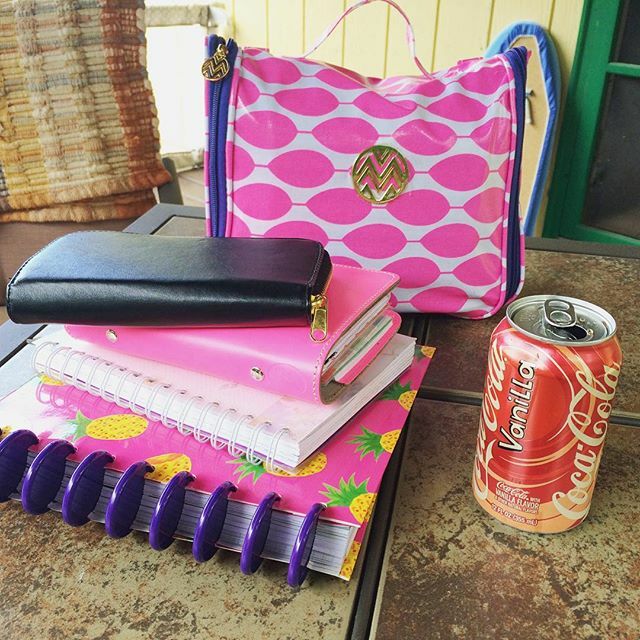 How many planners do you use? Any tips for multiple planner systems? Splitting the week onto 4 pages, interesting idea. Sometimes for is too much for me, but the W2P is too confining. I'll have to try the split week. Hope it's working for you. Where do you find the social media checkbox inserts?